A young Chinese man has been applauded for creating a user-friendly smartphone manual to enable his technically challenged parents to communicate with him via WeChat. Twenty-six-year old Zhang Ming majored in computer animation at Chongqing University and now works in Beijing. When Zhang visited his parents in Shandong Province for Chinese New Year, he bought two sets of smartphones for them so they could communicate with him through WeChat. Zhang thought it would be easy to teach his parents, but it turned out to be quite a challenge—his elderly parents simply could not pick up the skills even though he stayed with them for 12 days. Zhang, who later shared his experience on a microblog, said that after he returned to Beijing, his parents phoned him three or four times a week asking him questions on how to use WeChat. 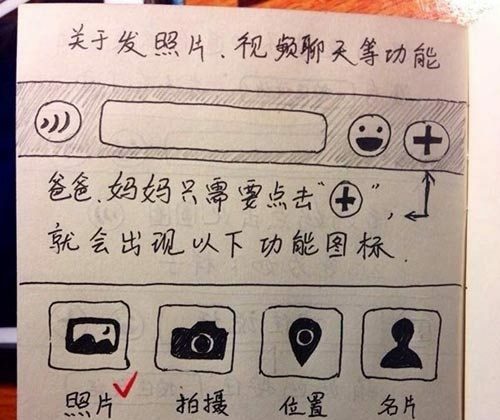 Zhang’s manual covers nine pages, each page incorporates the WeChat user interface of. He used colored pens to mark the functions and operational steps for each button and also added comments to highlight areas that needed his parents’ attention. Zhang explained that he wanted to dispel his parent’s anxiety and sadness. He didn’t want them to feel that they couldn’t learn something without their son being there. By sprinkling warm reminders, the user manual was also meant to soothe his parents’ longing for him¬. As long as they study the guide, they would feel that their son is with them, Zhang explained. The manual worked unexpectedly well. Quite soon, Zhang’s parents learned how to access the “Dial” and “Photo” functions. Whenever they have leisure time, they chat with their son over WeChat. When they miss their son, they browse the photos that Zhang sends them through WeChat. China’s much debated three-decade long one-child policy has created heavy social pressure for single children who often find it difficult to care for their aging parents, both physically and emotionally. Written in English by Christine Ford and Gisela Sommer.